The Hall Christy House was built in 1747 by a Peter John Hall who came to lower Dutchess County, New York from Rhode Island with his wife Ruth Reynolds Hall and at least four children. He was one of the first white men to explore the Clove Valley and did so with Indians as his guide. He was a Quaker and supposedly a cousin of Roger Williams on his mother's side. Ruth Reynolds Hall was a relative of General Nathaniel Greene. Originally the house was a single room home, built in the Dutch H-bent manner with a large fireplace and dog-leg staircase up to the sleeping and storage loft. This room is now the parlor of the current house. 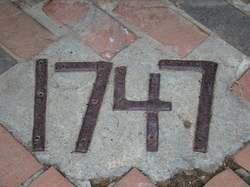 The iron "1747" numbers we found in a stoop( see below) would have originally been on the outside of that initial fireplace and were placed on the stoop when the later ca. 1760 addition of the dining room and bedroom over was completed. At that time there was a central back buttery that connected the two rooms. John died in 1782, leaving the house to his son Gideon. Gideon had ten children by his marriage to Rachel Clements of Tarrytown, Westchester County, also a Quaker. Gideon, despite being a Quaker, was a member of his precinct's Militia in the Revolutionary War and fought in the battle of White Plains, remaining a Captain after the war. Gideon died in 1830 leaving the house to his son Peter who, with his wife, Mary Tilton, had no children. It is at this point that the house follows the Christy line as one of Gideon's daughter's, Ruth, married a Leonard Christy and they had ten children while living in the house. There are many pieces of family objects which are being sold with the house, one being a blue painted blanket chest with "GH Christy 1829" inscribed in the inside lid, that chest having belonged to Gilbert Hall Christy born in 1807. During the Civil War, Gilbert partnered with his wife's ,Mary Tilton, brother to create a weaving firm of "Christy & Tilton". They made blankets at that time and sold them to the government. The current owners of the house still have some bobbins from the loom and some later ledger books. Their son, Peter Harrison Christie (Certain branches of the Christys changed the spelling of their name in the 19th Century to "anglicize" it.) also established on the original site of the house the "PH Christy Trout Breeding Pond", the first in New York State to experiment in trout stocking. The descendants of this Christie owned the house, coming to it sporadically up until the time a neighboring gun club bought the surrounding land and the house parcel as well, asking that the house itself be removed leaving only the trout stream that ran in back of it. It had not been occupied since the 1940's. It was in the 1980's that the current owners purchased and dismantled the house, storing it until they could find the perfect piece of property for it. This piece of property soon made itself available as well and is very appropriate. In the 1740's, the same time as the original Hall was building his house, the area was known as the "Oblong" , a long, narrow piece of land disputed between Connecticut and New York and settled by Quakers, first from the Purchase Meeting in Westchester and others from Massachusetts and Rhode Island. 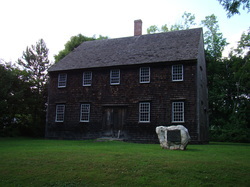 They built their own Meeting House in 1764, originally across from the present Meeting House (below left) adjacent to the Hall Christy House's current location. Unlike Gideon Hall, these Quakers were not receptive as a whole to the Patriot soldiers and when George Washington commandeered the Quaker Meeting House for a hospital during the Revolutionary War, the locals denied him wood for fire and food to keep the injured soldiers warm and fed. Luckily a few braved their neighbors' criticism and most of the solders survived, except for a few who are in stoneless graves in the area around the Meeting House. These Quakers were, however, in the vanguard of the abolitionist movement as in 1767, petitioning their Quarterly Meeting for the outright abolition of slavery, the first Quaker meeting in the Colonies to do so. Through the years, the lands around the Meeting House have remained bucolic farm land as was the piece the Hall Christy House is now on. The Skidmore house also has much history, being built around 1750, really only a valley over from the Hall Christy house, on lands that had belonged to the original grant given to Henry Livingston and then deeded to James Losee in 1781. In the Skidmore house, are the original grant and deed. It also so happens that Peter John Hall's eldest son married an Elizabeth Skidmore and an Abner Skidmore was witness to Peter John's will. These families are once again united on this one piece of land. Also in the room in the Skidmore house is a beautiful hooded painted cradle made by Andrew Skidmore in the 19th Century , a red painted miniature blanket chest belonging to the family, a small child's chair, a navy and white coverlet woven in 1844 for or by Eliza Skidmore, a rocker, a flour bag that says "J. Skidmore" , a butter churn, a Will and a Marriage Certificate, all of these items to be retained with the house. The present house as one sees it is basically the same house that existed by the end of the 19th Century. The current owners did add a few feet to the kitchen area and the library, with an overhang in between. The house has been on historical tours. They have been fortunate to share the house with descendants of both branches of the Hall Christy House and have pictures and a more detailed geneology that have been given to them by these visitors, all of which will be passed on to the new owners.